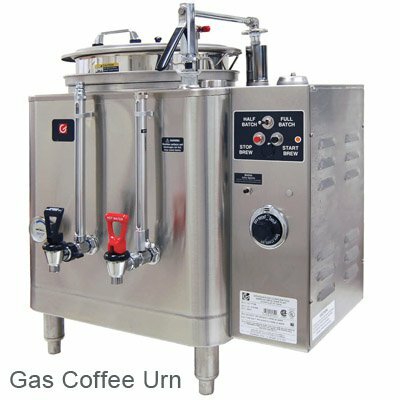 A coffee urn has two main functions: brewing coffee and keeping it warm for a certain period of time. It is a metal vessel featuring a heating element at the bottom. Most appliances are powered by electricity, but there are also non-electric models, which are heated with different types of fuel (oil, gasoline, propane, etc.) Thanks to large size, urns do not need to be refreshed all the time. They are very convenient when it comes to brewing hot drinks for crowds of people. Guests can pour as much coffee as they want using a spigot, and the drink will retain the optimal temperature. A coffee urn is a metal kettle with the bottom chamber just above the heat source. The bottom chamber is connected to a perforated basket for ground beans, which are found at the top, with a tube. To brew coffee, one should fill the bottom chamber with water and the top chamber – with roast ground beans. Then the urn should be placed on the heat source. As water boils, it goes up the tube and into the perforated basket filled with ground coffee. It soaks the grounds and trickles down into the bottom chamber through the holes. As you stick to the boiling point, the brewing process will continue without interruption. Some percolators feature electric heat sources, which prevent re-boiling. 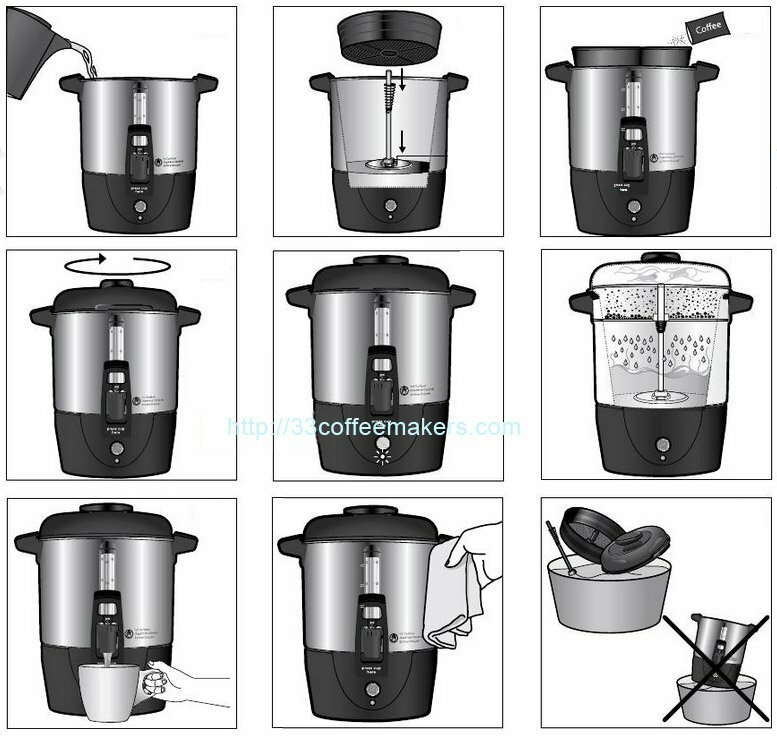 Appliances use a principle similar to that of a Moka (geyser) pot. In both types, water is forced up the tube by steam, which is emitted when water boils, and through the perforated basket filled with coffee grounds. Italian Moka coffee makers have separate chambers for water and just-brewed espresso. Therefore, once all water is poured into the upper chamber, the brewing process stops. Coffee urns do not have separate chambers, and the drink can be repeatedly run through the ground beans. Appliances are widely used in businesses, which require work with crowds of people. These include entertainment, accommodation, social work, etc., because urns are renowned for their high reliability and cost-effectiveness. They are very user-friendly, and anyone can help him/herself with a drink. This refers to various events that attract lots of people: weddings, conferences, parties, etc. Finally, it will not hurt to have such a thing at home, especially if you accept lots of visitors on a regular basis. How Big an Urn Should I Choose? 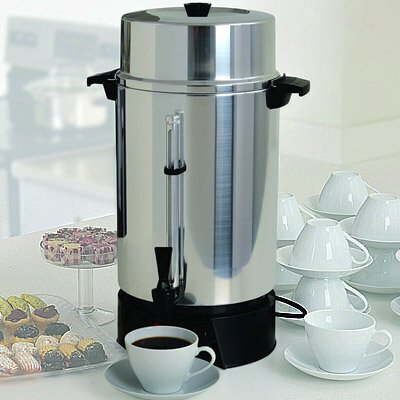 There are lots of coffee urn manufacturers, so the choice is quite extensive. Most commonly, an appliance can provide you 10 cups of coffee at a time. However, there are advanced commercial devices, which can make 100 cups or so at a time. Urns that boast higher capacity are larger in size. They range from small (10-20 cups at a time) to large (70-100 cups at a time). The price depends on the type, reliability, and capacity. Large appliances are the most expensive ones. However, it is a promising investment for those who have to use one a lot each day. Usability is a number-one criterion of a coffee urn’s popularity. Most models feature pull-handles or spigots, which are located close to the bottom or in the center, for more convenient use. Second, a spigot should respond quickly: coffee should start running exactly when you turn it on and stop right away, without dripping, when you turn it off. It is advisable to choose an urn with a high quality spigot. Dripping can cause a lot of mess, especially if lots of people are going to use it. Most appliances use electric heat sources, which are plugged into the mains either via a cord or an electric base. If you buy such a device, you should be ready to find a place near a socket or get an extension cord. Some devices feature thermostatic chambers, which can maintain proper temperature for a long time. Also, there are coffee urns featuring heating chambers that are filled with fuel (gas, oil, etc.) They give you more freedom, as you can take and use it anywhere. However, you must make sure the fuel is always there, so the flame will not go out and your drink will stay hot. Providing a constant supply of fuel can be challenging and not very convenient. Finally, non-electric heat sources are less controllable than electric ones in terms of temperature. Intended use: the appliance is intended for brewing coffee and for keeping it warm over an extended period of time. Pour desired amount of water into the water tank. NOTE: For the best results, always use cold, fresh tap water. side of the tank. DO NOT OVERFILL THE TANK. percolator tube. Do not use the urn without having inserted both tube and basket! NOTE: We recommend using coffee that has been ground specifically for use in a percolator. If using an electric grinder and whole beans, percolator coffee should be a coarse grind. Finely ground beans may cause the basket to overflow and result in grounds in hot drink. Placing a flattened paper filter in the basket will help prevent grounds from flowing into coffee.